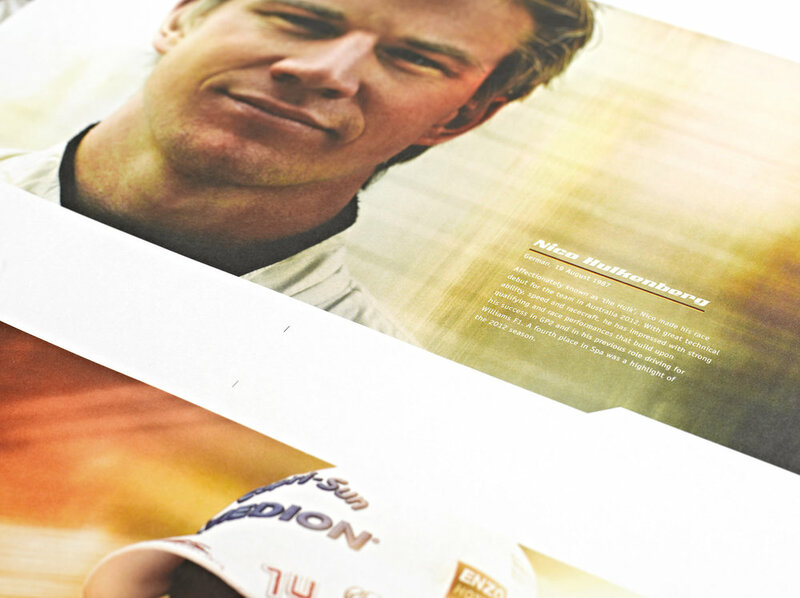 Entering their 6th season in Formula 1™, Sahara Force India commissioned us to design their first-ever brochure documenting the team's unique philosophy and showcasing the incredible journey the team has made. A balance needed to be struck – telling the Force India story from all angles. Team Principle, chief funders, the commercial demands and the men behind the wheel all unified into an engaging brand story that fans will relish and get future commercial partners excited about. We created a non-glossy, rustic brochure that had a distinctive look and feel. Our choice of stock and design process portrayed the right blend of professional and luxury, while still staying true to the engineering / design language of the team. Exciting and vibrant imagery was key. We post produced Sahara Force India’s imagery, giving it a unique look and feel that is now being used by the team across all of it’s marketing activity. We simply called it ‘FORCE’. At the launch of Sahara Force India’s 2013 race car at Silverstone, FORCE was given as a gift to all VIP’s, partners, and press. The feedback has been overwhelmingly positive; but perhaps most importantly it has been instrumental in generating interest from new commercial partners.